A method of investigation of processes that arise in aggregation of nanoparticles in colloidal solutions based on estimation of variations in the coefficients of rotational diffusion of nanoparticles is proposed. It is shown that rotational diffusion is more sensitive to variations in the dimensions of the particles than is translational diffusion. A comparative estimation of these types of variations is presented and the relative index of aggregation is calculated from the integral values of the autocorrelation function of depolarized dynamic light scattering. 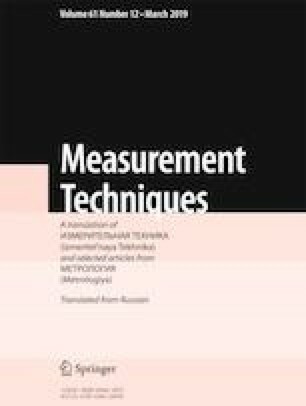 Results of numerical simulation of the proposed method and its experimental certification are compared. Translated from Izmeritel’naya Tekhnika, No. 12, pp. 13–16, December, 2018.